This month we’re taking a closer look at our Partech 740 Portable Suspended Solids Monitor. Our portable products are incredibly popular and it’s no surprise why – not only are they highly accurate but they’re also incredibly easy to use! 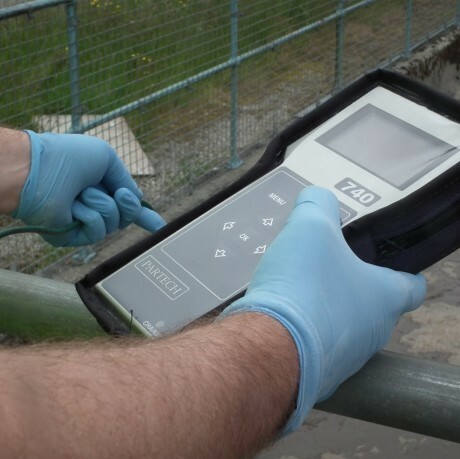 The 740 monitor is great at offering quick and accurate readings of suspended solids, sludge blanket levels, and turbidity. The robust enclosure of the IP65 includes a security strap and a sturdy protective shell just in case any accidents occur, so you don’t have to worry about dropping, impact or screen abrasion! The 740 monitor has some clever features, including the capability to store up to ten customer programmed user profiles. That means that each profile can be defined by site specific calibrations for whatever effluents need monitoring. The menu also enables a calibration adjustment which means that a specific sensor output can be stored in the memory at the same time that a liquid sample is taken. The final calibration figure is then a result of the gravimetric analysis of the suspended solids level in the sample. The display screen features a high contrast LCD and has been carefully designed to work in an expansive temperature range meaning you’ll never lose clarity. What else do you get in the handy carrying case we hear you ask? You’ll find a measuring probe, cable, battery charger and instruction manual all ready for you to use! What’s more, with its simple accuracy and ease of use, the 740 Portable Suspended Solids Monitor is great to use in a variety of places, such as activated sludge plants, final effluent outfalls, treatment plant inlets, streams and rivers. It’s also a way of double checking standards meet legislated requirements where other online and portable instruments are used.